80,000 Sq. Ft. | 76 unit/13 building apartment complex | Provided complete electrical scope of work, from new construction to underground utility distribution, and infrastructure. This complex was an aggressively scheduled project, which had to meet milestone dates for turn over by the developers, the Lackawanna County Housing Authority, along with Energy Star and Federal grant requirements. The project was built on the existing housing site, which was demolished to make room for the new facility. Failure to turn the units over on schedule would mean that the owners would lose the funding allocated for the project and tenants would be without homes. 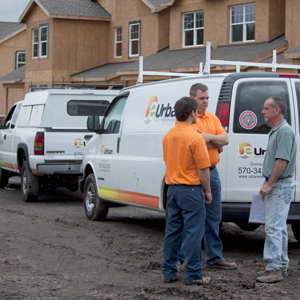 Urban Electric was brought in because of our ability to man the project and adapt to the aggressive schedule. The project was finished ahead of schedule!